Based on reviews from 25 experts and 4,833 users. Learn how our rankings work or see our guide to Adidas X football boots. Updated Apr 2019. As what its slogan shouts, “X is for the Game Changer.” And true enough, this series is serious about revolutionizing the game. The X is a speed boot engineered with the newest technologies, with the intent to create chaos on the pitch. It is best suited for players who are powered with the skill and the drive to dominate the playing field with unstoppable speed and agility. Being the innovative genius that it is, Adidas is never short of developing new silos that challenge what their competition has to offer. Among the latest and most raved about collection is the Adidas X. Packed with many of the brand’s top-sellers, this line is truly something to look out for. Here are what the archives had to say about the X series. The Adidas X football boot was not conceived until 2015 when much of the game had changed significantly. During this time, the sport promoted a new philosophy that categorized football players into two types - those powered by control and those by chaos. This current viewpoint prompted Adidas to create new boots, the Adidas X and the Adidas Ace silos. Prior to the launch of the X line, the company announced its discontinuation of some of their famous and historic series. These included the Adidas Adipure 11pro, Adizero, Nitrocharge and Predator boots. According to the company, they have developed a new technology for their new boots, the Adidas X and the Adidas Ace. The revolutionary tech is said to be a step ahead of its forerunner, the HybridTouch. The Adidas X model was designed for football players fueled by their talent and instincts to change the game. It enables its wearers to deliver unpredictability and speed on the field. This boot features the new TechFit collar, which is the brand’s answer to Nike Magista’s sock-fit low-collar design. The Adidas X made its first public debut on June 6, 2015, when it was worn during the Champions League Final between Juventus and Barcelona in Berlin. It was then made available internationally on July 2015. Since its release, the silo has gained increasing popularity among soccer players. An element that sets this collection apart from all other Adidas boots is its unique collar. This detail can be seen on the line’s premier models, like the Adidas X 17+ Purespeed. The Techfit collar allows for a sock-like fit on the feet. It gives players added stability and support during high-intensity moments in the game. This detail on the X is meant to match Nike’s Dynamic Fit collar seen in a few of its collection, including the Nike Magista and Nike Mercurial. Another impressive update found on the Adidas X boots is the firm ground/artificial grass (FG/AG) combination outsole. The new outsole is suitable for use on both natural grass and artificial ones. With the standard FG studs fused with tinier AG studs, players perform with improved grip, especially on harder AG surfaces. Boots from this silo feature an ultra-lightweight synthetic upper to keep wearers fast and agile on the pitch. The X-skin upper engineered on each model offers a bit of a thicker feeling compared to other materials, like the F50. However, it does provide a more comfortable experience for the wearer. The Adidas X boot is anything but traditional. Meant to cause chaos on the field, its release ushered in new technologies to the Adidas roster. X-Skin. This is an all-new material developed by Adidas. It consists of a complex three-layered system intended to provide performance, comfort, and protection in any conditions. This upper material is also quite durable and presents a dimpled texture that offers enhanced control on the ball. Moreover, it is also ideal for dribbling and taking on players. When it comes to shooting, the added texture across the upper makes a significant difference. Meanwhile, the extra cushioning helps limit the impact when making solid shots. X-Cage. Something most players may notice on the Adidas X is the funky design seen on the medial and lateral side of the shoe. These are reinforced layers in the boot designed to deliver support and stability. It keeps the balance between having a boot that is lightweight and one that is stable enough for fast-changing plays. These layers basically run through the boot’s lacing system, pulling in around the foot for an enhanced fit. With this feature, wearers need not worry about slipping around in the boot. X-Claw. This unique outsole offers a stud configuration that allows for the best cuts, turns, and accelerations. It combines FG studs, similar to that of an F50 stud pattern, with smaller AG studs for premium grip on both types of surfaces. Adidas made a bold decision to come up with this kind of sole, and it proves to be a reasonably good choice. The X-claw sole allows for superior traction while maintaining an ultra-light feel. Techfit Collar. This type of collar utilizes flexible support to provide a seamless, glove-like fit on the feet. This technology was initially used in workout garments like compression shirts and shorts. However, it was found to be quite suitable on footwear, making it a staple feature on modern shoes. Since it is remarkably malleable, the Techfit requires no break-in period, enabling players to use the boot right out of the box. Non-Stop Grip. This is a type of treatment on the upper that consists of a thin layer of raised dots across the forefoot. These dots keep the ball glued to the feet and allow for excellent ball control in all weather conditions. Wearers won’t get held back by changes in weather with this feature. These soccer cleats sport a lightweight Techfit compression that gives a perfect fit with zero wear-in time. A distinct feature on these X boots is its unique stud configuration. The sole features a combination of the standard FG studs and smaller AG studs. This combo enables the boot to unleash speed and traction on both natural and artificial grass. From the Adidas 15 up to the Adidas X 18 line, the brand has come up with quite a good selection of FG/AG boots. Among the top-end versions includes the Adidas X 17+ Purespeed which offer top-of-the-line features at a pricier cost. 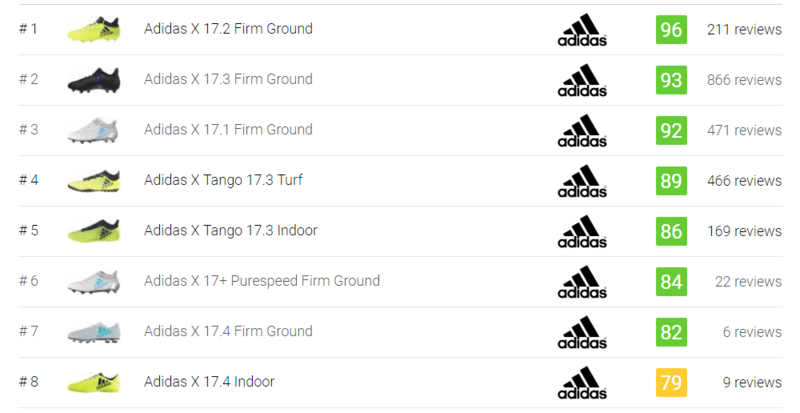 The take-down models, which are still quite impressive but less pricey, include the Adidas X 17.3 and X 17.4. With the release of two new collections, which includes the Adidas X line, the company has also relabelled their futsal collection with “Cage” and “Court” sole choices. The X court series are boots equipped for indoor football. Adidas formerly classified these shoes under the FreeFootball range, along with the brand’s turf options. Adidas X models under this series typically wear a gum rubber flat outsole meant to deliver the needed traction for smooth, flat surfaces. Despite the difference in the outsole, the court versions are fitted with the same upper construction as their firm ground counterparts. One of the latest court shoe from the Adidas X line is the Adidas X Tango 17.3 IN. It combines Techfit with a hybrid textile, laceless upper, similar to what can be found on the FG/AG version. For its outsole, it utilizes a Speed rubber construction for optimum grip and touch on the indoor court. The X cage series, on the other hand, are boots suited for the turf. These shoes have outsoles evenly covered with multiple small, rubber bumps that give enhanced stability and better release on turf pitches. Similar to the court series, they also use the same technology as their FG/AG version, save for the sole unit. Along with the release of the X collection, Adidas also launched its first set of X turf boots. Among these is the Adidas X 15.1 Turf shoes, a top-end fitted with a non-marking turf outsole that provides dependable traction and stability on artificial turf. It also features a breathable air mesh upper and a sock-like construction for a natural fit. In the search for the right football boot, a lot of questions can run through a player’s mind. Here are few questions that potential buyers may ask as well as answers that can help them in their quest to find the perfect boot for them. Which is the better series, the Adidas X or the Adidas Ace? That is quite a tough question to answer. Since players have different styles and preferences, the choice on which is the better boot will have to be decided by the player. However, to assist you in narrowing down your options, here is low-down on both silos, so you will know what it has to offer as well as what to expect. Although these boots might have been birthed quite at the same time, they are quite the opposite in terms of design and function. The Adidas Ace carries a form that will suit creative players who desire to gain more control of the field. Simply put, these boots are built for playmakers. The series is sometimes tagged as the rightful heir to the Adidas Predator series. However, Adidas contends that, as they declare it to be a synthesis of all previous models. On the other hand, the Adidas X is meant for football players who want to bring chaos to the pitch. Players who need speed and unpredictability on the playing field will enjoy this silo. It features a new Techfit material that provides a sock-like fit and feel on the feet. The line also introduces several new technologies that shoe enthusiasts are sure to love. What Adidas X firm ground boot is a good option when I’m on a budget but still want a decent boot? The great thing about Adidas as a shoe company is its dedication to create top quality shoes. Compared to other brands, Adidas some of the most reasonably-priced footwear on the market. Moreover, their low-tier picks are still very competitive, offering impressive features for maximum functionality. When it comes to the Adidas X line’s current picks, the Adidas 17.3 FG football boot is a clever option. At a price of less than a hundred dollars, you’ll get a boot that is built to resemble its top-end counterpart. In terms of design details, this cleat does not disappoint, as well. The upper features a four-way-stretch sock material that offers support and allows for fluid movement on the pitch. The mesh integrated in the upper provides much breathability while its mid-top design delivers supreme stability and a lock-in fit. This boot is also very lightweight and durable. It also promises an enhanced touch on the ball with its soft upper. The outsole, on the other hand, provides the needed traction to move with speed on natural and artificial grass fields.